Like most marketplaces, the industrial coating market becomes more and more competitive each day. Consequently, this competition cultivates an omnipresent sense of “We need to build a better mousetrap.” At Induron, our Research and Development Department is challenged with this exact task. With the help of our suppliers and partners, who consistently bring us the latest and greatest chemical technology, we are equipped with the necessary tools for innovation. Over the last few years, we have developed increasingly complex products that are solvent free, uber-corrosion resistant and uber-clean. The technology in our market is booming, which makes innovation more challenging. Then again, the best solution is not always the newest, most intricate solution. Sometimes the best solution is the simple solution. I believe this is the case with Induron’s newest NSF Standard 61-approved potable water epoxy, AquaClean. Because the marketplace is dominated by multifaceted products, such as moisture-cured urethanes that are loaded with heavy metals, instant-setting polyuria blends that mix in mid-air, and solvent-free epoxies that require heated plural component application equipment, we decided to take a step back. To discover a simple solution, we asked: “What has been proven to work in the past? What do painters like to work with? What looks the best on a freshly painted tank interior?” The answer to all of these questions was found in the technology of a polyamidoamine epoxy called Perma-Clean II Epoxy. This product has been around for years—longer than I have personally been in the paint business. Thus, we decided to develop a new product for the potable water market. We started with a very Steve Jobs-esqe question: “What do we want in the end and how do we effectively get there?” Surprisingly, the result was quite simple, but the process to get there was another story. After many months of hand-wringing, we decided to try to get our best looking, most user-friendly and best long-term performance testing epoxy approved for potable water immersion. 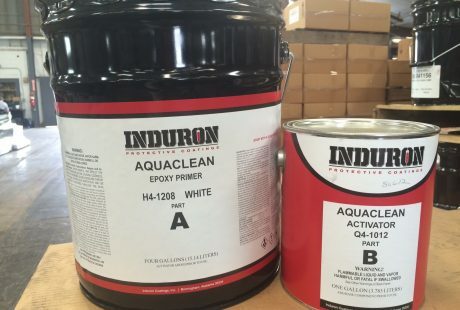 It required some bench work by our chemist, several trial application sessions and numerous time-consuming performance tests, but we finally were able to submit AquaClean for NSF Standard 61 testing. I’m thrilled to announce that it passed with flying colors. I believe AquaClean is the better mousetrap, not because it has the best bells and whistles or because it contains the latest and greatest technology, but because it is uniquely user friendly, good looking and long lasting. Traits like these are appreciated in darn near any marketplace—especially ours. Great product. It works in petrochemical storage, swimming pools, chemical/pharmaceutical facilities in all kinds of corrosive atmospheres so we know it will perform well in potable water immersion.